Gilliland has no prior NASCAR Camping World Truck Series (NCWTS) starts at Homestead, but spent two days testing there in August. Gilliland’s crew chief, Marcus Richmond, has a best finish of third at Homestead with Timothy Peters in 2014. He has two top-five and three top-10 finishes in 11 starts at the south-Florida oval. Gilliland earned his best career finish in the NCWTS at Gateway Motorsports Park in Madison, Ill., on June 23 when he jumped up to second place during a two-lap shootout on the final restart. In 18 NCWTS starts this season, Gilliland has one pole, four top-five, nine top-10 finishes and has led 208 laps. He led a race-high 62 laps at Texas Motor Speedway in June and another 60 laps there two weeks ago, including the final lap before running out of fuel on the backstretch coming to the checkered flag. What did you learn when you tested at Homestead? How would you rate your 2018 season? What are your plans for the off season? KBM-045: The No. 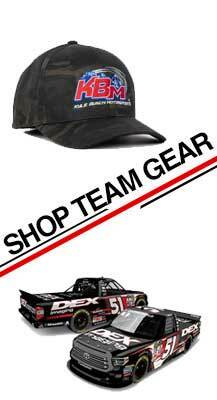 4 JBL/SiriusXM team will race KBM-045, for Friday’s race at Homestead. Gilliland has not finished outside of the top 10 with this truck in four starts this season. He nearly won with it at Texas two weeks ago when he ran out of fuel while leading the final lap.